What is Women's AFL Quebec? Women's AFL Quebec is a 9-a-side Australian Football competition played right here in Montreal. It consists of 4 teams, two from Montreal and two from Ottawa. These women's matches are played at the same venue and on the same match day as men's AFL Quebec matches. The Montreal Angels still remains as the leagues flagship representative team and participate in various tournaments and national championships throughout the year including a 3 game 18-a-side series against Ottawa. The best part about playing for the Angels is that we supply everything for you! All you need to do is have your own football/soccer cleats. A mouth guard is not essential but highly recommended. Some players elect to purchase their socks and others also purchase their own jersey and shorts through the club. This is purely optional. What league do the Montreal Angels compete in? The Montreal Angels participate in matches between New York, Boston and Montreal. The Angels also participate in a series of tournaments throughout the year including the Canadian National titles and U.S Nationals. 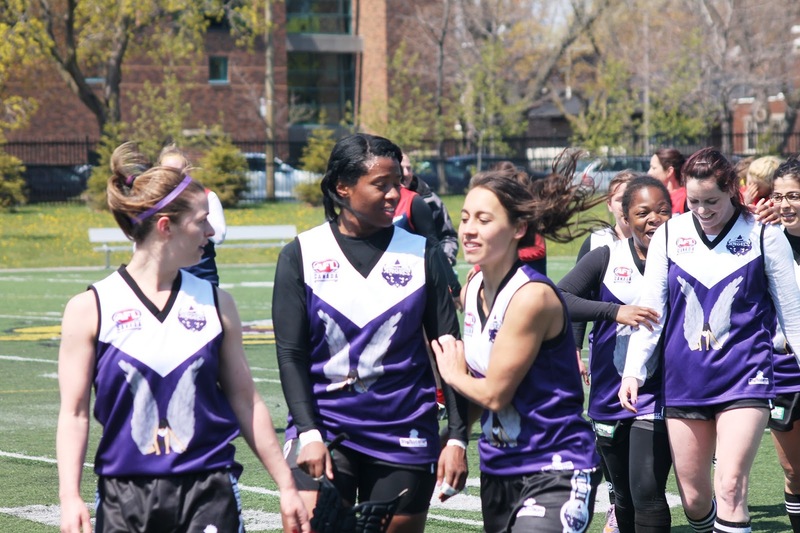 Angels players also participate in the Women's AFL Quebec competition, a 4 team local women's competition. The Montreal Angels train with the Quebec Saints at Parc Jarry most Wednesday nights from 6:15pm. Training is located on the field space near the hockey rink. Players driving to practice can park in the Rue Jarry Ouest car park and the team will be visible from there. Toilets are located close-by and are open most of the time. Players are advised to wear clothes suitable for running and shoes that they can kick a ball in. I've never played before, can I play? 9 out of 10 Montreal Angels players have never played Aussie Rules football when they join our team. We take players of all fitness levels and all skill levels. Aussie Rules is also a sport that needs all shapes and sizes, tall and small, fast and slow, super fit or just starting out, there's always a place for you. As a new and unique sport to Canada and Quebec we expect that Aussie Rules will be foreign almost everyone. Our coaching staff has been developing players from scratch since we started and the results speak for themselves. The Montreal Angels have had three players play for Team Canada at the 2011 International Cup and a further three represent Team Canada in its development squad. We don't expect everyone to reach the heights of national team selection and many of our players are just out to have fun. But whatever your goals, be it fitness, fun or the dream to one day play for Canada - we can make it happen. Aussie Rules is for you. Who are the Montreal Angels? The Montreal Angels are a women's Australian Rules football team located in Montreal, Quebec. Aussie Rules first found its way to Canada in 1989 with the creation of the Ontario Australian Football League. This league has since expanded to 10 division 1 teams, 6 division 2 teams and 6 women's teams. In 2008 Aussie Rules found its way to Quebec and shortly after in 2009 the Montreal Angels were created. What league do the Angels compete in?